Series: Yes. Daughter of The Pirate King #2. Huge thanks to my friends from Feiwel & Friends / Fierce Reads for sending me a review copy of this title in exchange for an honest review. This did not, in any way, affect my overall opinion of the book and/or the story. 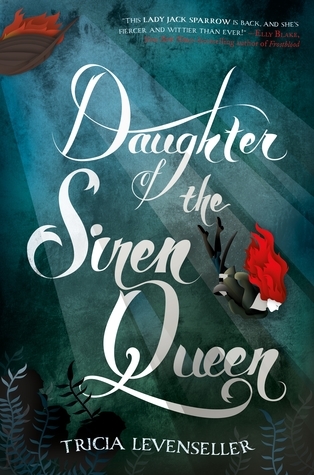 There’s no doubt that Daughter of The Siren Queen is one of my most anticipated sequels for the first half of 2018. I found Alosa’s story in Daughter of The Pirate King to be as thrilling as it is entertaining and I couldn’t help but get excited at the chance to read and feature the next part of her story here on BFR. And I’m extremely blessed to be able to do just that today. If you’re in the market for an enjoyable adventure with female (and some male) pirates, sirens, and non-stop action, I have to say that you’re in for quite an exhilarating ride in Tricia Levenseller’s newest book. Read on for a detailed review. As I previously mentioned on my review for Daughter of The Pirate King, one of the main reasons why I love this series is because of the feisty, and sassy heroine, Alosa Kalligan. She’s fierce, she’s dauntless, and she’s totally badass. Her whole being screams women empowerment. She acts in very calculated ways, and I can’t help but thank her ruthless father, the Pirate King, for training her to be the incredible young woman that she is. Alosa still managed to keep me wrapped up in her story, and I most certainly hope that this book isn’t the end for her. I want to see her grow, and face new challenges, and this is because I feel like I’ve never met an extraordinary woman quite like her since Katniss Everdeen. Another thing that made Daughter of The Siren Queen stand out for me is the exceptional cast of characters that were aboard the Ava-lee like Niridia, Mandsy, Roslyn, and the entire crew that Alosa cared so much about. Their voices were all very distinct, and I really enjoyed getting to know them one by one. I also appreciated that throughout the novel, we get to discover how Alosa came to recruit most of them. I love how they all seem to fit in Alosa’s story perfectly, and I can’t imagine for this story to be as impressive as it is without them. If the author ever wrote a spin-off for these characters, I would want to read it so bad, it might actually hurt (physically and emotionally!). And last, but most certainly not the least, is the undeniable chemistry between Alosa and Riden. Of course, I wanted to focus on this. I can’t help it. There are scenes that just made me completely smitten. Their chemistry literally radiated off the pages of the book, and there were times that I really had to put the book down because of how much swoon there was in excess. I was helpless. I adore Alosa and Riden as individuals, and even more as pairs, and I can’t even write a comprehensive review just thinking about how much I love them. I’m trash, obviously. But hopefully, you get what I mean. Because I swear, their love story is addicting, and I. Want. More. Have YOU read the Daughter of The Siren? How was it for you? Tell me all about it via the comments section below! I also saw your review for Daughter of The Pirate King and the fact that you seem to love both books makes me want to pick these up. Hoping to see copies of this and the first book at either NBS or Fully Booked!